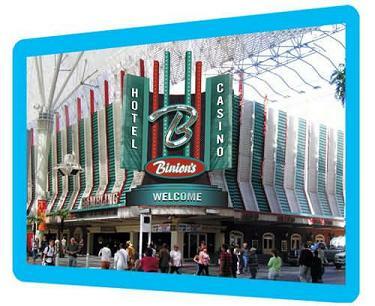 Binion's Sports book: Medium size with all new Lcd tv’s for betting and watching. Lounge in same area provides a great watching experience. All the popular Slots, Video Poker, Live keno(buy ticket downstairs, live feed comes from 4 Queens), Keno machines, Penny slots, Black Jack, 3 card Poker, Big six, Let it Ride, Poker Room (34 Tables), Pai Gow poker, Roulette, Craps(10x odds when betting 5 dollars), Progressive Slots. And some newer games: Black Jack Switch, Ultimate Texas Hold’em. Unique to Binion's Casino: 2 dollar Jack Daniels drinks at any casino bar 24/7. 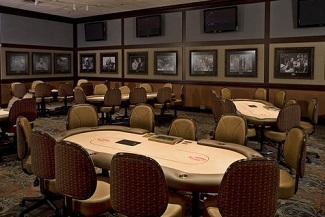 One of the biggest Poker rooms in all of Vegas. Restrooms: All are clean, use the ones closest to the Hotel side for a more modern décor. 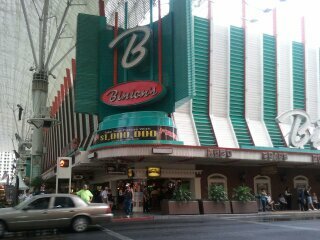 Binion's Overall Atmosphere: Fun, lots of happy people. This is a top quality Casino.